Now that’s a funny name!!!. Sud-sud (or sad-sad as some people say) in Konkani means loose and it looks very weird when I am writing it in English :). Sukke is a dry dish which usually has coconut. Kalva, Tisre, Khubbe are 3 different types of clams. There are some people in your life, with whom you get attached/attracted very fast. One such person whom I totally adore is V’s maternal grandmother. She is 80+ years old, but she is so full of energy that I always get lots of inspiration from her. She was a great cook, but don’t cook these days because she cannot walk so much. But she still loves to learn new dishes, talk about them, give me new dishes. She knows I love to cook, so whenever we call her, she has one or the other recipe ready for me. She even collects them from newspapers to give to me. This time when we were in Bangalore, we went to meet her. She wanted to give me so many recipes – some new, some age old. (I think V was very jealous because I was getting more attention than him 🙂 ). This recipe is one age-old recipe she gave to me. I cooked this while I was in India. This was the first time I cleaned clams on my own. I left one shell with the clams to give it a “restaurant style food” look. You can discard both the shells or use one as I did. Anyway while eating, the shell is discarded, but according to me, it’s a lot of fun to eat the clams with shells (only some clam fans will understand what I am saying). I simply loved this dish. This is my entry to Sig’s JFI tamarind. Thanks Sig for extending the deadline, I was having a brain block thinking what to send. I just realized today, this may be the best entry from me. Heat oil and fry onion till they are translucent. Add coconut and fry for a min. Now add the clams, cook for 2-3mins. In a bowl, mix chilli powder, turmeric, tamarind, salt. Add this to the clams mixture. Cook till clams are done. Serve hot. Usually my mom makes it like a curry… at least that’s how most catholics do. Will definately try this like a side dish.. I’m sure it will taste great with daali thoi . thanks for sharing. Isn’t it great to prepare and enjoy such lovely recipes handed over by Grandmas! I totally love her enthusiasm and her passion about food! check my blog! theres something in store for you! Mouthwatering dish from clams, I always had it western style but I think I will love this one more better.Oh i am so touched by the love ur maternal Gma shares with u. You are lucky to get hold of Clamps. Here we do see them on television where Chefs keep showing you recipies with clamps and encouraging you to get some but I have been searching for fresh clamps for the past 4 years but am yet to find them. The only ones that I have seen are in a bottle and pickled without the shell. In Goa there is a similar recipie called Tisre Dhab Dhabe. Your recipie looks very delicious. Shilpa: Sheetal, I had cooked these in India. Here in US, I am yet to try this. I have seen clams in Chinese stores and also in Costco here. Not sure if it is available in UK :(. Check out big supermarkets. You can use kalva too if you can find them there. I stay in San fransisco, Bay Area CAHere you have tons of places to buy clams and fresh fish from in USA. Any Chinese store will definitely have fresh and even frozen options. Baby clams or clams = tisrye, shinane= mussels, kalva = oysters. You will find fresh fish which they will clean and cut as per your liking. 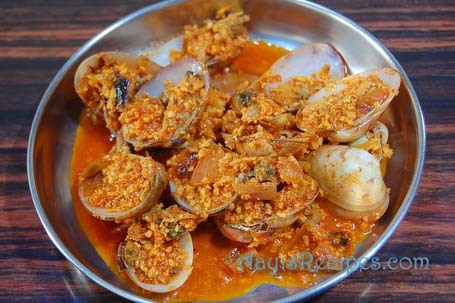 You are right Shipla,Its a real fun eating and cooking clams with shells..
name is so funny……. Looks so delicious. This is my FAVRRETTT dish ever. Every time I go back to Mumbai I make my mom make it. Sometimes – just for variation, she puts coriander leaves and also bits of kairee when the season allows. yummmmmmm…. OH WOW!!! My mouth is watering!!! This looks amazing! Does the traditional recipe use Kokum here in place of tamarind ? Shilpa: No, for this one we use tamarind. This recipe is very similar to the Goan recipe my family follows. And actually leaving one shell is quite common too – “ek-shipi”. We add kokam in stead of tamrind. Ah… my mouth is watering at the thought of this suke and hot rice. Need to look for some clams (uncooked). Thanks Shilpa for this wonderful site. I am a seafood lover but usually I dont cook as something goes wrong most of the times when I cook. But ur receipes are utterly delicious & mouth watering. Specially this Clams in dry masala. I like clams very much. Also thanks to post the pictures which gives us an idea how the dish shud look like. Can you pls tell me what type of masala (mirchi powder) is required to be used for fish recipes due to which such red colour appears. Pls do let me know. Shilpa: I use Byadagi chillies that I get from India or Indian store here in US. first cook the onion and clams (halfs), green chillies cut into small bites, little chilli and turmenric powder with two spoon of water and salt. After this is cooked for 10 minutes add the coconut and pinch of sugar(optional). cook for 2-3 minutes more and add the “Sola” and (not the tamarind) switch of the lume and let rest for 5 minutes and ready to serve. No use of oil at all in this receipe. Your recupes are of a great help not only to me but all. I am newly married, trying to lear cooking non-veg. i was a pakka south canara konkani girl , never used to eat nonveg. but now have started to eat and cook too. The recipes are are really traditional and great. i appreciate your efforts. Thanks a lot. Thanks Shilpa for this lovely website … using this website properly for many years now and today i again felt it posting thanks to you.. I used the traditional knife (the one shown in here) to open them up. You could also boil them and take the meat out, I have never tried that though, I always like to use them raw. I have no idea what is available in Australia, if they are clams, you can use them. I found this blog on friday and I am soo happy to see konkani food. & I have visited ur site every day since then. Its kinda food Facebook for me…:)….I love your concept and soo happy to see konkani food here. Thank you so much. Reminds me of my mom’s cooking. I already tried egg burji with a difference and tried averkayi dosas. Turned out amazing. Thank you once again. Slrup slurp.. its so tempting. Thanks a ton to you and aayi. Your sincere efforts to update the site with well explained recipes along with the pictures has made our life easier in the kitchen.. Loads of luv to your son. Wish to meet you one day..